It’s fair to say consumer spending has been on a bit of a rollercoaster ride since the Brexit vote in 2016. Defying expectations of a sharp slowdown, consumers continued to splash the cash, lifting retail sales to the dizzying heights of 7% YoY towards the end of 2016. But almost with the flick of a switch, consumers slammed on the brakes in early 2017 – a theme that persisted through the rest of the year as higher inflation started to bite. We saw further evidence of this in Friday's retail sales figures. Admittedly the Christmas trading period appears to have been a mixed bag, but the British Retail Consortium has said that many firms were forced to offer steep discounts on non-essentials in the final weeks before Christmas, heavily pressuring margins. It also noted that the difference between food and non-food sales has “never been so stark”. So will 2018 bring better news? Well, at this stage we see few catalysts for consumer spending to pick up over the next few months. True, prices have now more or less adjusted to the pound’s post-Brexit plunge now. But food prices could continue to rise, especially now that the supermarket price war, that led to deep reductions back in 2014/15, appears to have eased (evidenced by retailers' ability to pass on higher imported food costs last year). The recent rises in oil prices will also put extra pressure on consumers over coming weeks as they filter through to petrol stations. 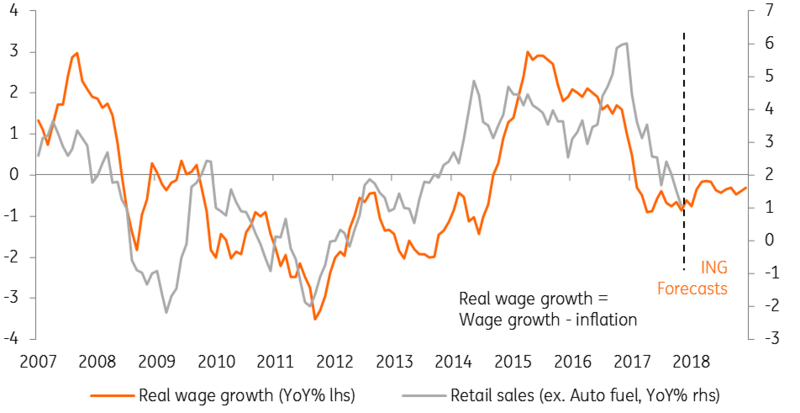 We're also a little more cautious than the Bank of England on wage growth. Policymakers are looking for a sharp pick-up given the ultra-low unemployment rate, which is creating some skill shortages and thus higher pay packets in certain sectors. But with the economy still struggling and other input costs continuing to rise, some firms are likely to take a more cautious approach to pay rises. There are also some signs (admittedly very tentative) that the weaker growth through 2017 is starting to catch up with the jobs market. Perhaps with all of this in mind, consumers are now the least confident they’ve been since 2013, even when compared to the immediate aftermath of the Brexit vote. 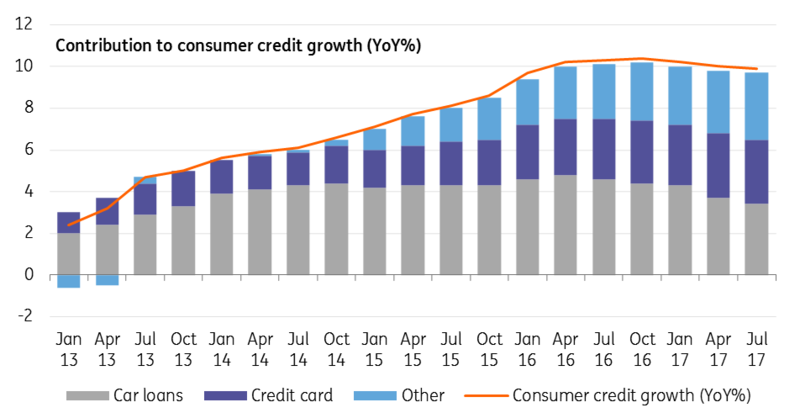 At just under 10% growth year-on-year, the rise in consumer credit over the past couple of years has been fairly eyewatering - and was probably one of the reasons why spending remained resilient in the immediate aftermath of the referendum. It is worth saying that car financing has played a major role in this increase, and this is more down to changes in the way consumers purchase vehicles, rather than a sign of economic malaise. Recent research from Bank of England staff also suggests that the rise in car loans, and indeed 0% credit card financing, has been led by borrowers with the highest credit scores. However, this is unlikely to tell the full story and we suspect at least some of the rise in unsecured consumer credit has been down to households having to finance some day-to-day spending. If this was the case, we're likely to see this pattern continue over the next few months given the ongoing income squeeze - although recent measures by the Bank of England to raise capital buffers may see credit growth slow to some degree. Whatever the case, as we learnt at the end of 2016, a borrowing-driven rise in consumer spending is ultimately unlikely to prove sustainable. 3 How will consumers react to rate hikes? When it comes to the consumer outlook, this could be the wild card. Until November, households hadn't been confronted with a rate hike for almost 10 years, and a large swathe of the younger population hasn't experienced one at all. So how will they react? Well, as the Bank of England was keen to point out back in November, the financial implications for households of one or two rate hikes are likely to be fairly minor. Around 60% of mortgage holders are on a fixed rate product, a much higher proportion than 4 or 5 years ago. 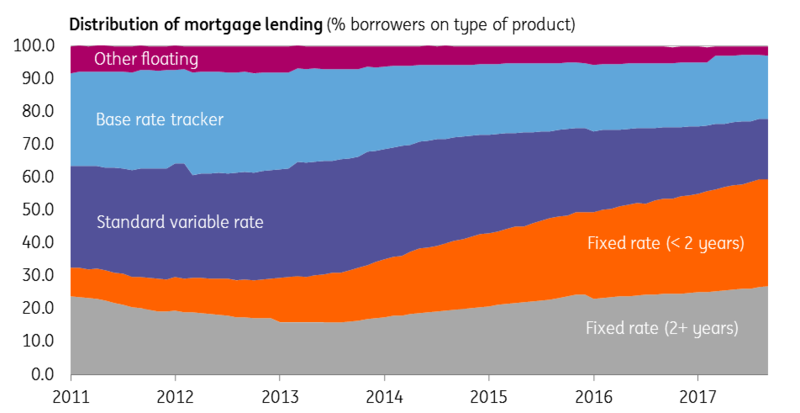 And whilst unsecured consumer credit has risen sharply over the past couple of years, the interest rate spread is generally pretty large, meaning small changes in Bank Rate are unlikely to make a meaningful difference. But the psychological impact could be more interesting. Whilst markets are tuned into the finer details of the Bank's forward guidance, we suspect consumers are more likely to see November's rate hike headlines and extrapolate - perhaps anticipating both faster hikes and a higher end point for Bank rate over the coming months and years. None of this is likely to put a major dent in consumer spending, but could see households become a little more cautious in their financial planning. Whilst the worst of the consumer squeeze may be behind us, it's pretty clear that the end of the tunnel is still some way off. That means it's likely to be another sluggish year for growth; we're forecasting 1.4%, which is pretty stark compared to our predictions for the US and Eurozone (3% and 2.4% respectively). Admittedly, the Bank of England's forecasts already assume a fairly subdued path for consumer spending, instead pinning hope on investment taking the lead. If a Brexit transition agreement can be reached by the end of the first quarter (which look's achievable), that should certainly help by averting the risk of a cliff edge - although of course there are still a number of big challenges still looming. Given the outlook for growth, and the fact that core inflation looks set to return to target around the summer, it's a pretty close call as to whether the Bank of England will hike again this year. We narrowly think they won't, although if they do, we think May's meeting is the most realistic opportunity before Brexit noise heats up in the summer/autumn.